I remember the cottages well. By the time I started train-spotting at Relly Mill Bridge in 1960, only Mr Grimes lived in the cottages. the others were empty and derelict. I had a railway signalman friend who worked at Bridge House Signal Box on the main line. The only way I could visit him was to go over the sleeper crossing over the Bishop Auckland line, through Deerness Cottages back yard and down the path to the signal box. I had to go very quietly because if he saw me, Mr. Grimes would chase me. Hi, need your advice on the cottages as we seem to have 2 photos and i am confused as to which is correct. i think t5he one with the train with only the 2 chimneys (link to Broompark memories in second comment below). Hi Val, i saw this post earlier but thought you might be referring to some cottages in Ushaw Moor. After seeing the reply by lampwort ~ and if he is correct in the cottages being those at the junction near Broompark – or Relly bridge, i also remember them well and knew the Grimes family. Mr Grimes was always chasing kids off. i only recall the Grimes family being there but seem to recall there might have been another family moved out of the end house prior to 1960?. I think mr Grimes considered himself a caretaker of the cottages and maybe at some time kids had vandalized one of the buildings to make him chase us off but i am also thinking one of the vacant houses had fruit (maybe goosberries) that we used to raid ? Brian Grimes was the older son and he put up a huge Tarzan swing in a big tree over the rail from the cottages on the bank in the woods overlooking the Beck and the big viaduct and i think this attracted lots of kids from all over the place. John Grimes was younger and i often played with him and he also came over to the Broompark village and also had a sister that also came over who i think was joan. From memory, i only seem to recall maybe 4 houses in that row of cottages yet you mention 6 families in the neighbors.? But i do recall there was a couple more houses along that lane you mention which ran from Relly bridge down to the cottages and about halfway down on the right was a big square water tank which i remember some of us took a dip in on a warm summers day. Roy Lambeths photo collection has a photo of the cottages which i may have put on the wordpress Broompark site. I am also still trying to find a photo i once found of the water tank. Here is a link to the Broompark memories. If you scroll down the page to broompark gallery on the right there is a picture of the cottages. Seems i was wrong and it does look like 6 when you count the windows.the middle ones would have been sharing the same chimney. good that your mother can still remember all those names. I see those same surnames around now so maybe relatives.Can she recall if they were still all occupied in 1954.?We only moved to Broompark in about 1955 and i was only 5 years old But did stay with my grandparents prior to that for short stays in a caravan on Relly farm and close to the bridge and the lane down to the cottages. Their name was Albert and Agnes Turner and their daughter Josephine. Grandad socialized often at the Stonebridge inne. hi my m other recalls that some of the cottages were still occupied when we moved ,but cant remember who was still there at that time .I recall going to the farm with my dad for milk and eggs, ithought it was great at the time.we don’t remember the Turners ,but actually my mam worked at the Stonebridge inn for Ivy and Foster Walton ,pity she cant remember your granddad. Ron, for reference, “Lampwort” is Roy Lambeth. There were 2 rows of cottages at Dearness Valley Junction. 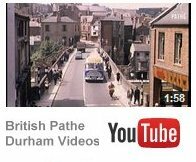 I used to catch the United Service 44 (Hamilton Row or East Hedley Hope bus) from Durham and got off at Relly Steading. The bus driver once told me the fare stage was called “Relly Mill Bridge”. Standing on the old road bridge looking south you could see the Dearness Valley Branch curving off to the right with a footbridge over it at the junction. Just over the footbridge was a ground mounted large square water tank and behind it a row of cottages which by 1960 had only one family as inhabitants. The husband was a railway man but I never met him. His wife kept many chickens and used to supply Stephen Dent, George Hauxwell, Michael West and myself glasses of water and sometimes biscuits. The path from the footbridge went down the left side of these cottages to a sleeper crossing over the Bishop Auckland line which led to the second row of cottages where Mr Grimes lived. Thanks for that Roy, I had obviously totally forgotten that the other houses near the water tank were another row of railway houses. I remember the lady with the chickens and also remember that she was calling out to us once but we ran like hell because somebody in Broompark had made some story up about an insane person living in one of those houses. I suppose stories get exagerated. Looks like we may have missed out on a few biscuits lol. no not mr grimes .The man you are on about lived near us our side of the track.Apparently he was a bit strange. i can see now when i look at the photo of the other houses why i do not remember them as a row like the row where the grimes family were. I remember the fence now and peeking through the gaps but because of the scary stories i mostly just kept walking quite fast past there.That photo must have been taken from the bank on the other side of the rail and i never got a view like that when walking past. But looking at the photo you can see the outline of the Broompark village in the right of the photo. When i was 4 and also 5 and before we lived in Broompark i stayed with my grandparents in the caravan on school holidays. I was born in 1950 at Gateshead hospital and lived in Birtley. Grandad had a clydsdale horse called dobbie and a cart and i can recall he sometimes drove it down to the Stonebridge pub and took me with him and often he got drunk and made me take the reins to drive home. But the horse just went home anyway.